I’m not sure what most informs my opinion of I Declare War. It could be the school shootings we’ve heard and read about for years now. It could be the memory of war games that me and kids like me played—in our own backyards and in nearby woods, many years before that. Maybe it’s the current video game debate. But I know I found I Declare War to be a frustrating film: compelling, memorable, disturbing, but not always good. Not everything it had the potential to be. This is the story of a group of boys, and one girl, aged between 10 and 14, playing a game, outside, on a sunny weekend afternoon. There are positives to this, not the least of them cardiovascular. But the problem is the game they’ve chosen to play. It’s an elaborate version of Capture the Flag: overlaid with complex military strategy and a sparse set of rules that are too easily bent. It works like this: you point your toy gun at your target, make some noise, and he must fall to the ground. There he must wait, able to do nothing for ten seconds. He is not dead, just temporarily out of play. To kill a member of the opposing team, you must connect with a red-paint-filled balloon (a ‘grenade’); once splattered, the player must go home. Victory is achieved when the opposing team’s flag (held at their hidden base) is captured; or, presumably, when every member of the opposing team is killed. We never tried paint-grenades, back in my day. Our moms did our laundry, and would’ve killed us. And I remember, too, the problem with fighting a war game with guns that don’t shoot: at any reasonable distance, your opponent will claim you missed. This is hinted at only once in the film, but it would’ve been a constant problem. We used water guns. 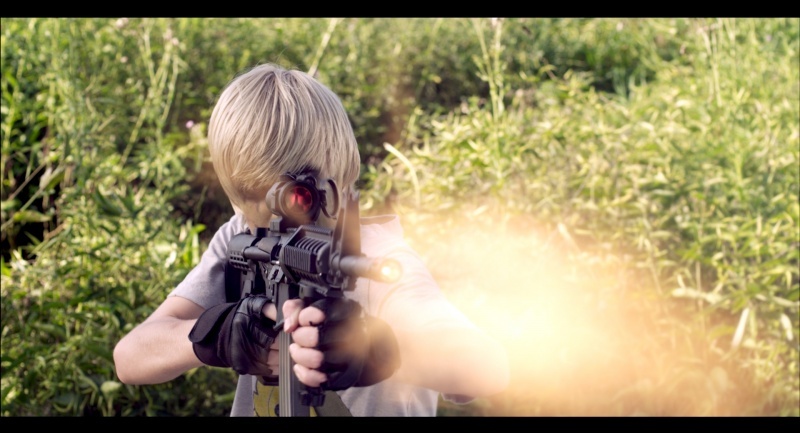 Directors Jason Lapeyre and Robert Wilson get around this, more or less, through an artistic choice: by filming the kids, most of the time, with real guns. Guns that fire, violently; so that what we see on-screen are boys and girls gunning each other down. Only occasionally is the illusion lifted: when we see a child holding a stick, or a chunk of plastic with a toilet paper tube for a sight… or, when the child who has been shot sits up, ten seconds later. I Declare War is not intended to glorify violence. The directors are clearly aware of how unsettling some of these images are, and how unsettling, too, the idea of children nonchalantly carrying out orders on a ‘battlefield.’ But its moralizing is foggy. The game leaves a lot of room for real violence, but only if you cheat—so you may wonder if the film defends the concept of just war almost as much as it condemns our insensitivity to violence in general. Plus, the game looks fun, and is often fun to watch. The challenge with scripting I Declare War, I suspect, was creating a film more compelling for how its characters felt than for what they were trying to accomplish. That’s not easy. And the truth is, we want one side to win this battle—the good side, led by the more appealing, more moral general—the one who obeys the rules. I Declare War is a better war movie than it is a message movie about war. The performances are uneven. Gage Munroe, as P.K. Sullivan, five-foot strategic mastermind, is excellent; he sounds like a leader, even when he spouts geeky military factoids at his troops and lionizes the rules they must follow. His loyal friend Kwon (Siam Yu), is convincing as a younger boy, captured by the other side, who truly fears what will happen to him. Several of the other actors seem amateurish, however. And they aren’t helped by the dialogue, which may be intended as parody, but comes off phony and clichéd. There is a fine line. Though the situations in the film were believable to me, only a few of the children were. Still, I recommend the film. It looks good, it’s engrossing, and if the actors themselves cannot always sell you on what’s going on, the knowledge that a game like this could be underway, near you, right now—maybe with your kid on point—will keep you chilled. Check it out. 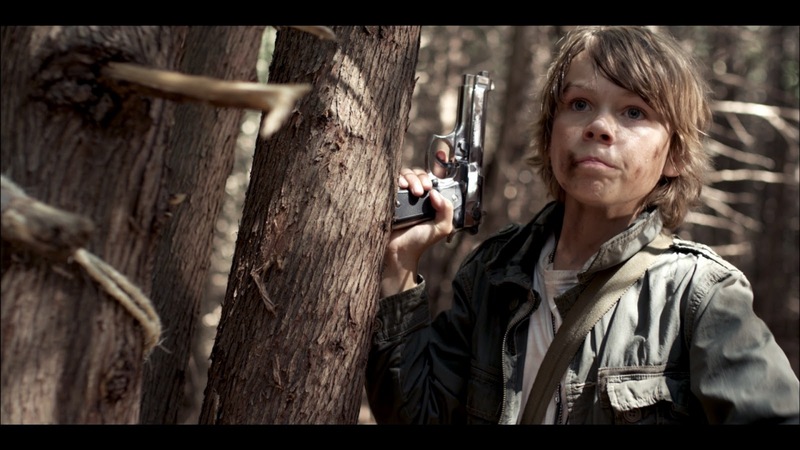 I Declare War screens at Toronto’s TIFF Bell Lightbox starting May 10, 2013. An in-person intro and Q&A by the filmmakers will take place during the 7:15pm screening on May 10. All public screenings will be preceded by Joe Cobden’s three-minute short film, Vive la Canadienne.